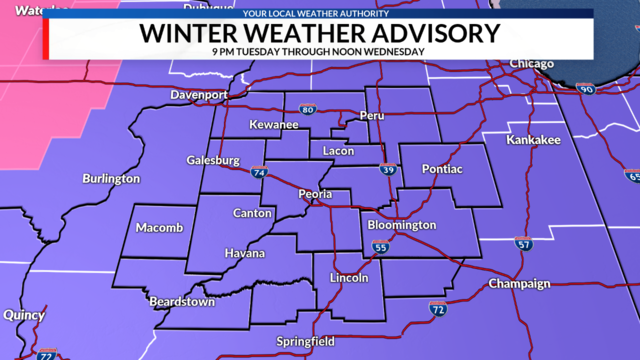 Peoria, IL - Its probably the last thing you want to hear, but another winter storm will bring ice and snow to Central Illinois Tuesday night and Wednesday morning. The National Weather Service has issued a Winter Weather Advisory for all of Central Illinois from 9 pm Tuesday through noon on Wednesday. Light snow will develop south of I-74 after 8 pm and will gradually spread north throughout the evening. Snow is expected to reach I-74, impacting Galesburg, Peoria, and Bloomington between 10 pm and midnight. Those north of I-74 will see widespread snow after midnight. Drier air is expected to move in aloft causing snow to change to freezing rain and freezing drizzle overnight. For those along I-74, this change over should happen around 3 am Wednesday. 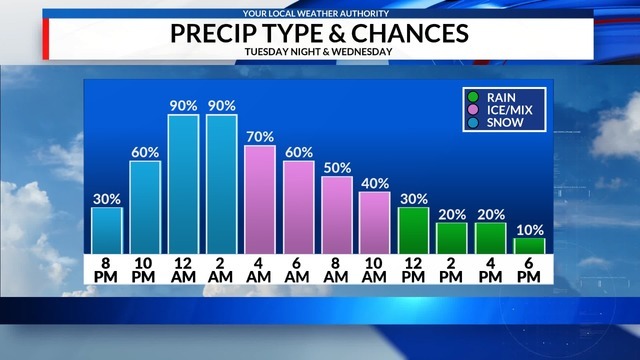 Areas south of I-74 will see this change over around midnight while those closer to I-80 will likely see snow through much of the night before a change over to freezing rain or wintry mix after sunrise on Wednesday. Any lingering freezing rain showers will change to all rain for areas south of I-80 by noon as the storm system begins to move away from the region. 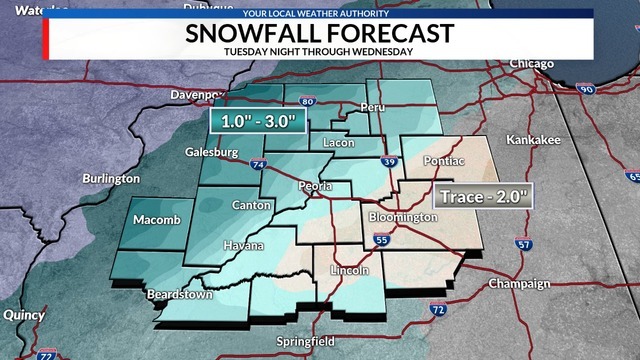 Widespread snow accumulations of 1-3 inches are expected throughout Central Illinois with the highest snowfall amounts falling west of the Illinois River. As little as a half inch of snow may fall along and east of I-55 between Bloomington and Pontiac. 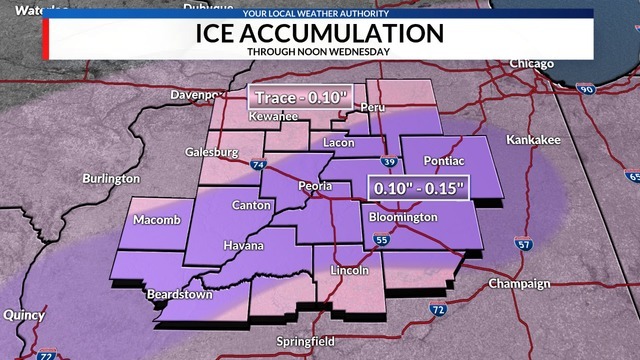 Confidence in ice accumulations remains low but the potential of 0.10" to 0.15" of ice accumulations will be there for much of Central Illinois, particularly south of a Macomb to Ottawa line. While this is not expected to be a significant winter storm, the combination of light snow with a layer of ice on top of it will make for a slippery Wednesday morning commute. Winds will be blustery from the east at 10-20 MPH with gusts up to 30 MPH possible. While widespread power outages are not expected, the combination of blustery winds and ice accumulations could lead to a few outages and downed tree branches.